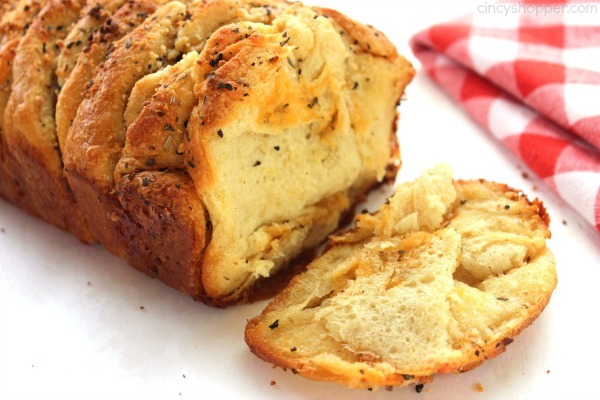 This Easy Garlic and Herb Pull-Apart Loaf makes for a quick dinner side or even a snack. Since we use store bought biscuits for this loaf and very few ingredients, it can be made in just a few minutes time. My family is big bread eaters. My kiddos will make homemade bread just to snack on. One of their favorite side dishes happens to be our CopyCat Red Lobster Cheddar Bay Biscuits. We make them very frequently. 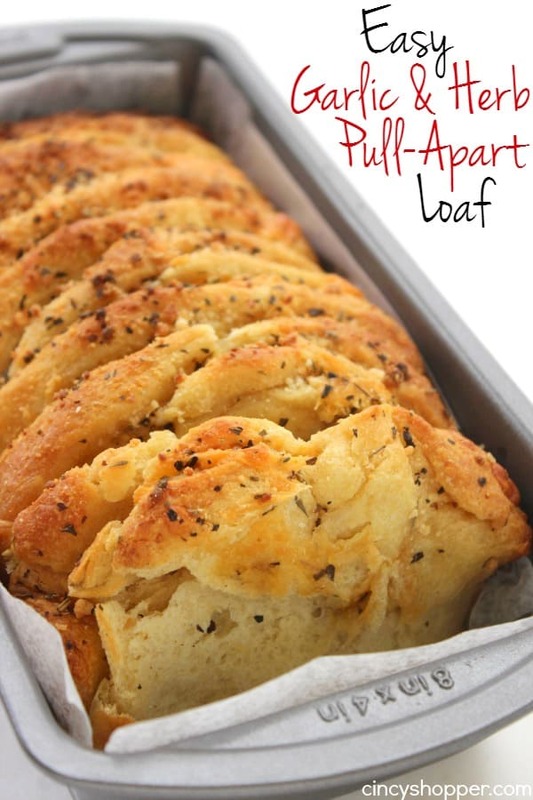 Pull-Apart bread has become very popular lately. I think it is the novelty of being able to just pull yourself off a piece, ha ha. You can make these loaves from scratch but I rarely have time to make everything from scratch. This recipe was so super simple and no need to have to wait for dough to rise or pull out half of the items in my pantry to make it. 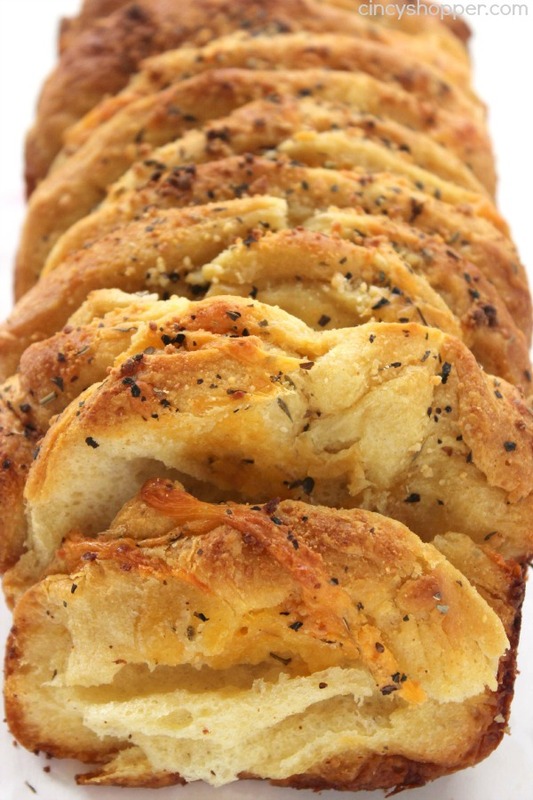 Garlic bread is always a favorite for almost everyone. I like to serve up a loaf with most of our meals. 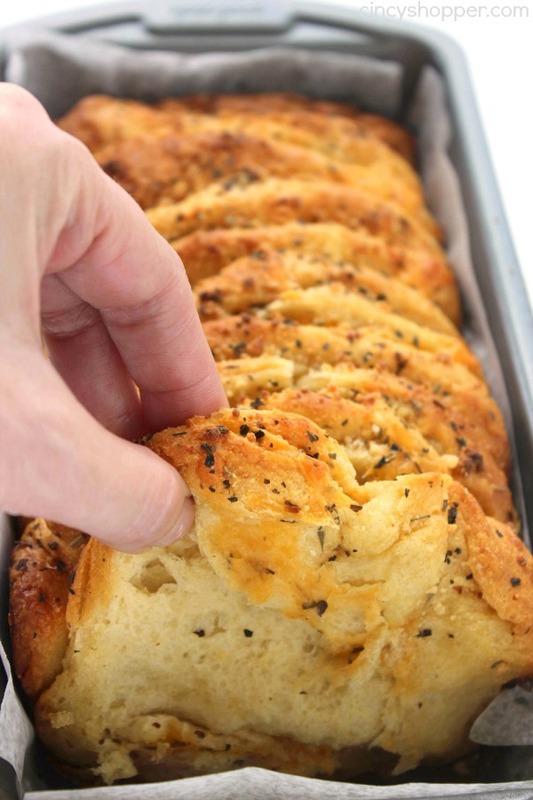 The flavor that is found in the Easy Garlic and Herb Garlic bread is phenomenal. I added in both Parmesan cheese as well as some sharp cheddar. 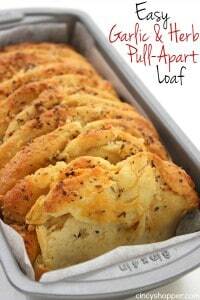 You could make the loaf without cheese if you are looking for a more basic garlic pull-apart loaf. My family devoured one loaf in just a couple minutes time and requested that I make two loaves from now on, lol. They were all very pleased with the flavors but wanted more, ha ha. 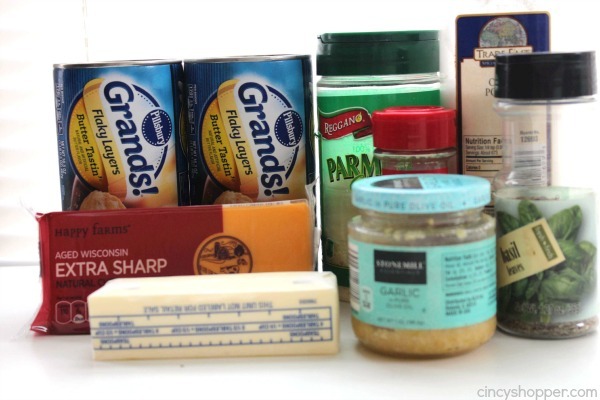 Note that the ingredient picture below shows two cans of Grands! Flaky Layers Biscuits but I only used one can. The ingredients are just so super simple. I used Garlic, basil and oregano. 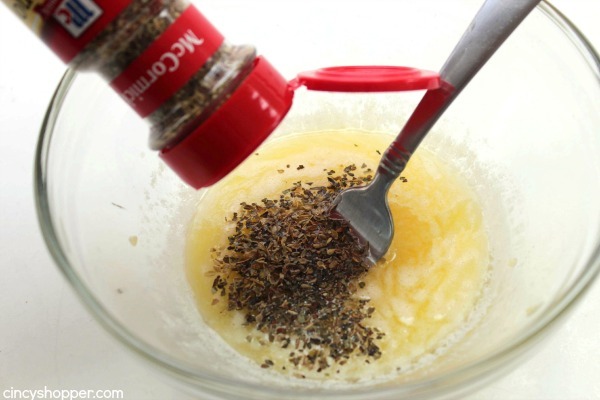 You can add in your favorite herbs if you choose. The herbs we used seemed perfect. Grease loaf pan and set set aside. Open biscuits and cut each in half (making 2 thinner circles). Add garlic,onion powder, basil and oregano to melted butter. Mix well. Brush each side of biscuit with butter mixture. 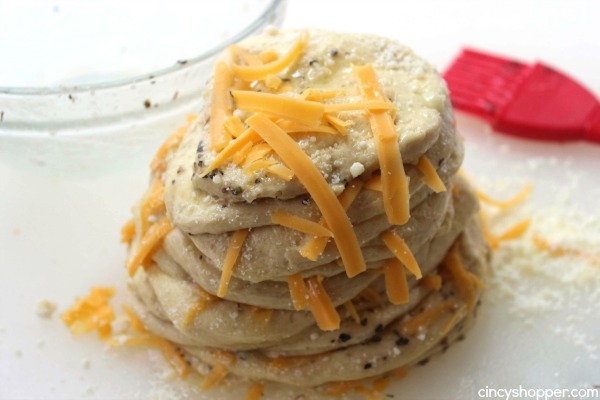 Sprinkle top with Parmesan and Cheddar. Repeat with each biscuit placing on top of last. Transfer biscuits to loaf pan. Bake for 30 minutes. Check periodically and if tops are getting brown, tent with aluminum foil for remaining time. 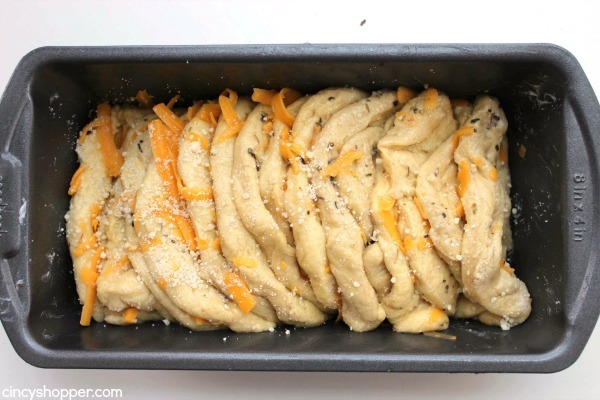 I know this loaf recipe will now be a frequent addition to our family dinners. As a matter of fact, I plan to make two loaves to add to our Italian Spaghetti Dinner tonight. This looks really good! Pinning to save for later. 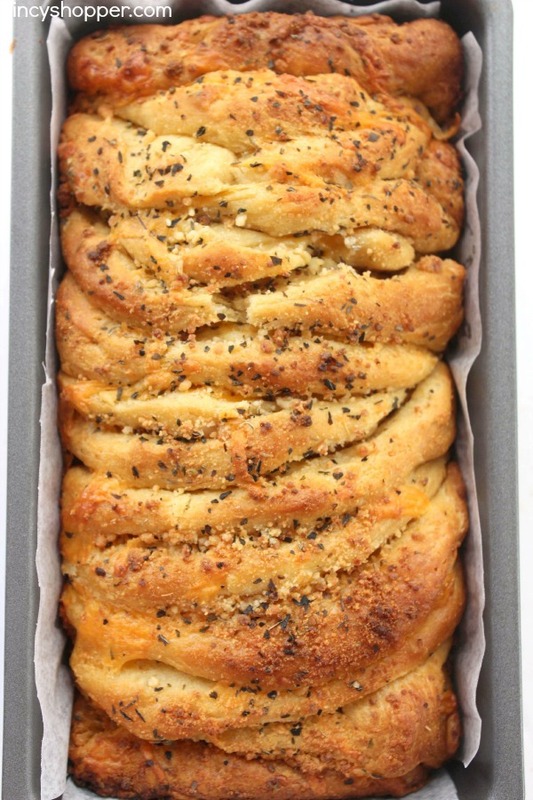 I love garlic and definitely love bread…. Oh be still my expanding thighs! ! I’m sure at least 2 loaves at a time is must! Stopping by from Wonderful Wed. Blog Hop to pin and tweet. Wow – that looks delicious!! Pinning this to try one night! 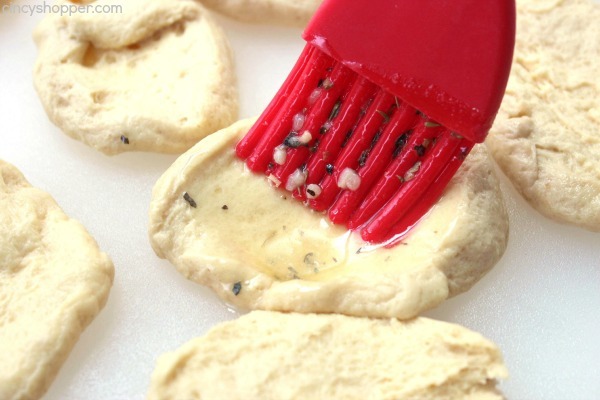 I am so glad to see store bought biscuits used for this! I was hoping it would be that easy. :-) This looks so great, and perfect for spaghetti night! I’m from the philippines, and i’m not sure if we have the grands biscuits. Can i make it from scratch? How? Any alternative? This recipe looks absolutely amazing! Thanks for sharing at the Wonderful Wednesday blog hop. Pinning and tweeting. Hi, I made this over the weekend and I had trouble getting the middle section to bake. I had to keep putting it back in the oven. It took at least an additional 14 minutes to bake, did I do something wrong? Otherwise it was a big hit! Going to make this using mozzarella cheese! What the hell are Grands Biscuits???? I’ve never heard of them or ever seen them! Where are you from? All the grocery stores here ( in America ) have them! They really look good! All the canned biscuits are so bad for your health. Made w GMO flour and other ingredients we should not eat . Learn to make your own w/non GMO flour available at Publix King Arthur flour is non GMO. Wal Mart has not gotten the new flour so their bags do not reflect this info. This is perfect. I love how easy it is. Pinning for later. Yum! What a great idea to make them into a loaf! I can hardly wait to try it. Pinned! Delicious! Thanks for linkin’ up with What’s Cookin’ Wednesdcay! That looks so yummy! My middle son has a birthday coming up and he requested a spaghetti dinner; I think I’ll make this to go with it (minus the cheese which he doesn’t like). Pinned. This looks fantastic! I need to make this next time I make spaghetti for dinner!! Thanks for the recipe! I see why this was featured! It looks so good. I can’t wait to try it. Thanks for sharing on the Creative Exchange Link Up Party. saw this and looked so good, I tried it tonight. It was good and soft. I took into account regarding the middle, so i tented and baked 15 m longer. 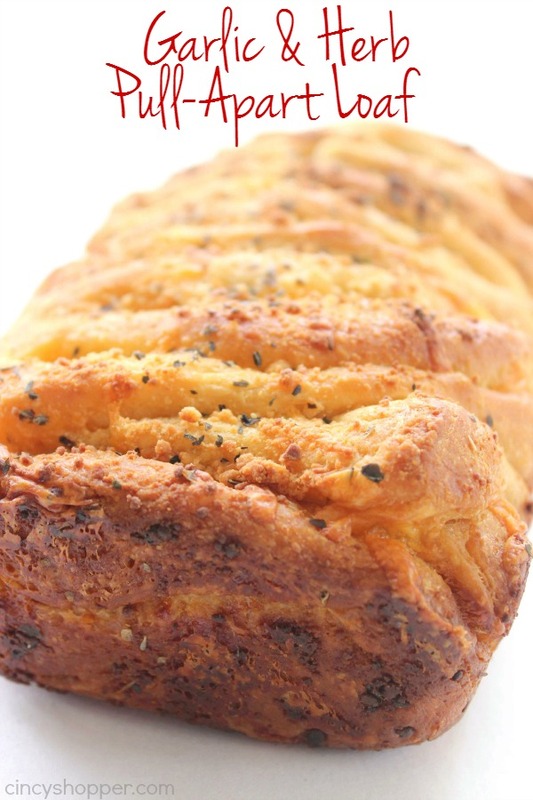 I like garlic and herb breads. This one sounds like it gives you a head start when you need to save time. This would go great with Spaghetti! I need to make some!! Really great recipe – was a crowd pleaser. Already tried my own variations!! Hi Cathy!I am sorry yours did not turnout well. We have made it quite a few times and never had that problem. Were you using a dark or a glass loaf? Can this be assembled an hour earlier, refrigerated, then baked right before dinner? What size loaf pan should I use cause I have a lg and a small one.